Perhaps not what you think of when you think of a botanical garden—the Quarry Gardens might best be described as a a natural woodland enhanced by a loose chain of plant galleries designed to showcase the site's various ecosystems. 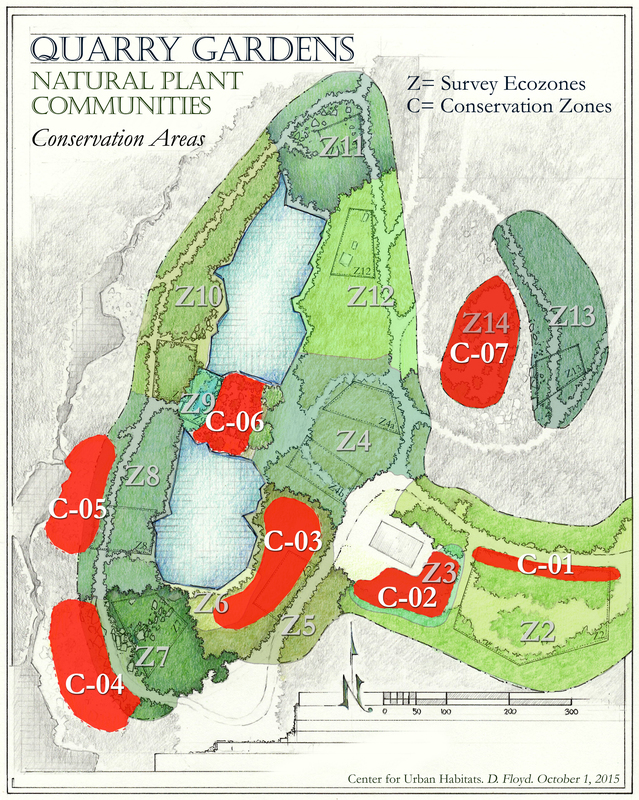 The plan of the gardens is to protect, advance succession, and build out native plant communities in 14 ecozones and 7 conservation areas immediately surrounding the quarry pools. Soil around the quarries—magnesium-rich, with both acidic soil and pH in many areas nearing 8 (alkaline)—supports the growth of ecosystems and plant communities unusual for Central Virginia woodlands. Knowing what to plant required a thorough study of what was already here: the trees, shrubs, herbaceous plants, ferns, fungi, reptiles, amphibians, insects, and birds that made up the existing ecosystems. Surveys of biota (which continue) as of fall 2018 produced a consolidated list of more than 700 species—some 480 flora, 220 fauna—including 40 species not previously reported in Nelson County. The gardens’ designed galleries include prairies, butterfly and pollinator gardens, an amended wetland, three vernal pools, barrens, a fern gully, and a waterside talus. In all, nearly 50,000 plants of 198 species have been added, of which 97 are new to the site. See the status of each in The Native Flora Galleries database. Every month the Gardens are open to visitors—April to November—something exciting will be in bloom. Come and be surprised!